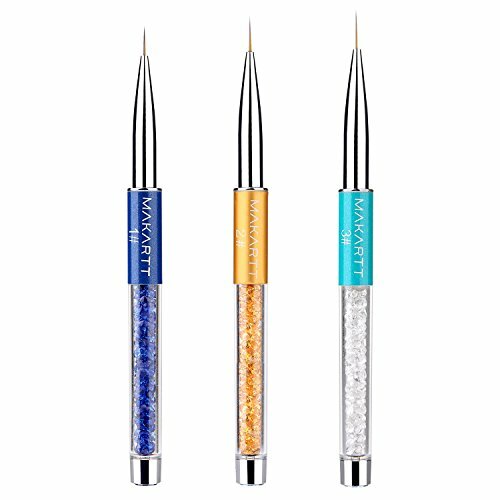 The package includes 3pcs nail liner pen which comes with 3 different size: 1# 7mm, Blue; 2# 9mm, Golden; 3# 11mm, Cyan, ideal for drawing lines & fine drawing on nail tips. The Pen body is made of high quality Alloy + Diamond + Acrylic material, durable enough for your daily using. With the thinnest brush hair and the shine Rhinestones inside the handle, fashionable design, best for painting. Easy to handle and operate, making your nails more beautiful and charming. With a cap, convenient to use, also protects the nail brush from dust. Great for professional nail salons and diy nail art at home. 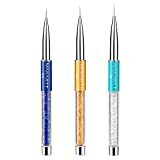 Best Buy Gift for girl friend, daughter, and mother who love manicure on Birthday, Christmas, Thanksgiving and Halloween.